The Haplotype Finder Tool can easily detect haplotypes between several DNA sequences. By default the first sequence in input file is established as reference. The Random Generator Tool implemented by the DNAux Software was created to rapidly generate a lists of random elements in a text file (such as DNA sequences), allowing the user to choose the number of iterations and the number of elements in each list. 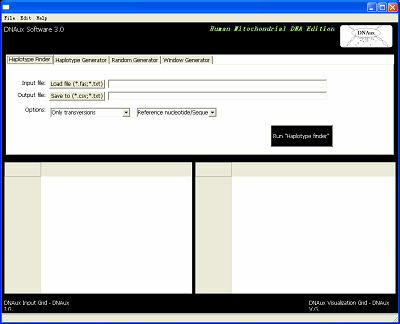 The Sliding Window Sequences Generator allows users of the DNAux system to generate a list of partially overlapped sequence fragment from any DNA sequence. The user is free to choose the length of fragments and the step between them.